The second and third best features of LyX you aren’t using. LyX is a WYSIWYG editor for latex files. It’s a little bit clunky to use at first, and isn’t perfect (thank you, open source developers– I’m not ungrateful!) but after becoming familiar with it, it’s probably the single piece of software that has most improved my productivity. I like it so much I use it not just for papers but often as a scratchpad for math. Many times during random discussions I’ve used it to quickly bang out some equations and after seeing how fast it was, others immediately switched to using it. Anyway, while macros may be the best feature you LyX aren’t using, I recently discovered another couple excellent ones I wasn’t familiar with after years of use so I thought I’d publicize. Specifically, I’ve always hated the process of including explanatory figures into LyX. Exporting plots from an experiment is tricky to improve, but when trying to create explanatory graphs, I’ve always hated the process. Before, I thought the options were. 2) Write the graphics directly in LyX in a language like TikZ. This is more “in-place” in that you don’t have external files to find and manipulate. However, I find TikZ to be quite painful to get right with many re-compilations necessary. If the TikZ document is in place each requires a full compilation of the document. This is hilariously slow when making something like Beamer slides. Further, this totally violates the whole point of WYSIWYG since you’re looking at code, rather than the output. There are better ways! I’ve wasted countless hours not being aware of these. This is OK, but has the disadvantages from (2) above. The code can be huge, if I have a lot of graphics, I can’t tell what corresponds to what, and I have to do a (slooooooow) recompile of the whole document to see what it looks like. You can then click on it to expand the code. This solves most of the problems: You can see what you are doing at a glance, and you don’t need to recompile the whole document to do it. Again, LyX will show it in-place and (if LyX is configured correctly…) correctly output vector graphics in the final document. Then the external editor will automatically open the file. You can then save it with a keystroke and go back to LyX. No hunting around for the file, no cycles of exporting to other formats, and you see exactly what the final output will look like at all stages. You can really tell that LyX was created by people using it themselves. This one is described well-enough already, but helps a lot in big documents: you can click on a point in a generated .pdf and automatically have LyX sync the editor to the corresponding point in the file. Specifically, it is common to profile your code and discover that 90% of the time is spent computing the in that function. This comes up often in neural networks, as well as in various probabilistic architectures, such as sampling from Ising models or Boltzmann machines. There are quite a few classic approximations to the function, using simple polynomials, etc. that can be used in neural networks. If , then we can lower-bound the probability of outputting +1 by a pre-computed value of , and short-circuit the computation in many cases. 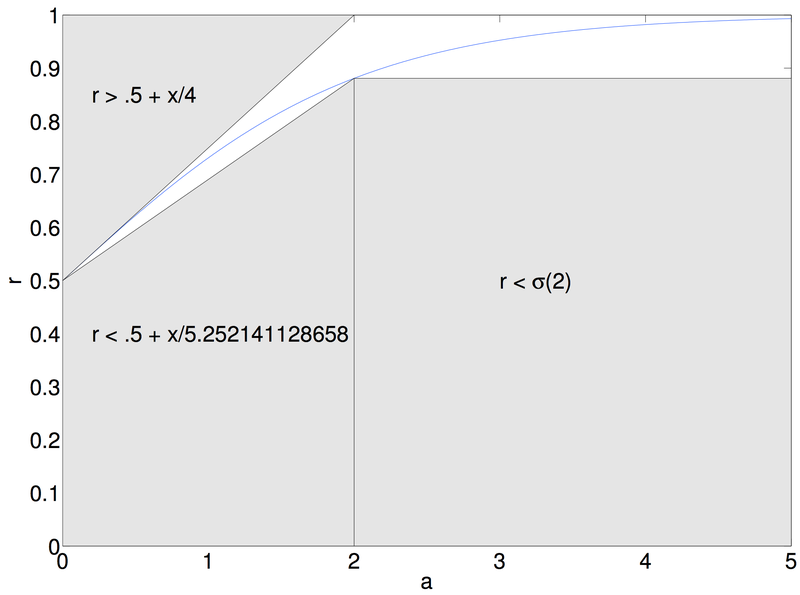 If , then we can upper bound the sigmoid function by . If , then we can also lower bound by respectively. (This constant was found numerically). The three cases are illustrated in the following figure, where the input is on the x-axis, and the random number is on the y-axis. Since, for all at least a fraction of the numbers will be short-circuited, sigmoid calls will be reduced appropriately. If is often near zero, you will do even better. Obviously, you can take this farther by adding more cases, which may or may not be helpful, depending on the architecture, and the cost of branching vs. the cost of computing an . This is simple enough (“the complex conjugate divided by the squared norm”), and we recover the rule for the quotient easily enough by multiplying with . Based on a lot of requests from students, I did a lecture on matrix calculus in my machine learning class today. This was based on Minka’s Old and New Matrix Algebra Useful for Statistics and Magnus and Neudecker’s Matrix Differential Calculus with Applications in Statistics and Econometrics. which allow a similar shuffling with dot products. Still, these are certainly less easy to remember. seems to have particular importance here, and I’m not sure of the best choice. Automatic differentiation is a classic numerical method that takes a program, and (with minimal programmer effort) computes the derivatives of that program. This is very useful because, when optimizing complex functions, a lot of time tends to get spent manually deriving and then writing code for derivatives. Some systems like cvx do a great job of recognizing simple problem types (linear programs, cone programs, etc. ), but can’t handle arbitrary functions. At present, automatic differentiation involves a degree of pain. Typically, the user needs to write C or C++ or Fortran code and augment the code with “taping” commands to get it to work. There is also usually a significant computational overhead. STEP 1 The user writes the function they want to optimize in a convenient high level language like Python. This is easy, but slow, and provides no derivatives. STEP 2 The user feeds their high level function into a library. This library uses operator overloading magic to build an expression graph representation of the function. This expression graph is then used to generate efficient machine ode for both the function, and its derivatives. Thus, the user gets everything, with out having to compromise: maximum performance, and maximum convenience. Since this is how things should work, I spent some time this past summer writing a library that does. The above code is actually a working example, calling the compile_fun method– the only method a consumer of the library needs to know about. This library comes tantalizingly close to my goals. Though this is very simple code, it seems that gcc still uses some super-linear algorithms, so it can’t handle large functions. Now, clearly, I am doing something wrong. Frankly I am writing this largely in the hope that someone who actually knows something about compilers and programming languages can enlighten me. 1) Use a better compiler. I’ve tried this. I can turn off gcc’s optimization, which decreases compilation times, though to a still very slow level. Alternatively, I could use a fast compiler. tcc flies right through the code. Unfortunately, the machine code that tcc generates is very slow– I think due to poor register allocation. 2) Don’t generate intermediate C code– directly generate machine code or assembly. This would certainly work, but there is no way I am up to it. Maybe it would make sense to target the JVM? 3) Use one of the newfangled just in time virtual machine things, like LLVM or libJIT. This seems promising, but after quite a bit of research I’m still really unsure about how well this is likely to work, or how to proceed. 4) Write a fast interpreter, and just pass the bytecode to this. I’ve tried this as well. This is basically the strategy used by some autodiff packages, e.g. cppad. This can get reasonable performance, but will never compete with native code. The reason is– I think– that the interpreter is basically a giant switch statement, and all the branching screws up the pipeline on the CPU. At this point, the library is useful (I use it!) but only for relatively small problems, containing no more than, say, a few thousand variables. If anyone has ideas for better compiler flags, or knows about the feasibility of targeting LLVM or libJIT instead of C code, please get in touch. Disclaimer: There are a bunch of minor issues with the library. These are all fixable, but it isn’t really worth the effort unless the compilation times can be dealt with. The function cannot branch. (No if statements). If you want to multiply a matrix by a scalar, the scalar must come after the matrix. I know it works on 32 bit ubuntu with everything installed via synaptic package manager, and on 64 bit OS X, simply using Sage (with this patch to make scipy/weave work). If you want to play around with this, but aren’t a python programmer, I would suggest using Sage. I’ve been reading Alan Sokal’s lecture notes “Monte Carlo Methods in Statistical Mechanics: Foundations and New Algorithms” today. Once I learned to take the word “Hamiltonian” and mentally substitute “function to be minimized”, they are very clearly written. This works when is symmetric positive definite. Now, all is a matter of cranking through the equations. Which is exactly the iteration we started with. The fact that this would work when is symmetric positive definite is now obvious– that is when the objective function we started with is bounded below. The understanding that Gauss-Seidel is just a convenient way to implement coordinate descent also helps to get intuition for the numerical properties of Gauss-Seidel (e.g. quickly removing "high frequency error", and very slowly removing "low frequency error"). My previous rant about automatic differentiation generated several requests for an explanation of how it works. This can be confusing because there are different types of automatic differentiation (forward-mode, reverse-mode, hybrids.) This is my attempt to explain the basic idea of reverse-mode autodiff as simply as possible. Reverse-mode automatic differentiation is most attractive when you have a function that takes inputs , and produces a single output . We want the derivatives of that function, , for all . Point #1: Any differentiable algorithm can be translated into a sequence of assignments of basic operations. Here, each function is some very basic operation (e.g. addition, multiplication, a logarithm) and denotes the set of “parents” of . So, for example, if and , then . It would be extremely tedious, of course, to actually write an algorithm in this “expression graph” form. So, autodiff tools create this representation automatically from high-level source code. Point #2: Given an algorithm in the previous format, it is easy to compute its derivatives. The essential point here is just the application of the chain rule. Applying this, we can compute all the derivatives in reverse order. That’s it! Just create an expression graph representation of the algorithm and differentiate each basic operation in reverse order using calc 101 rules. No, this is not the same thing as symbolic differentiation. This should be obvious: Most algorithms don’t even have simple symbolic representations. And, even if yours does, it is possible that it “explodes” upon symbolic differentiation. As a contrived example, try computing the derivative of . The complexity of the back-prop step is the same as the forward propagation step. In machine learning, functions from N inputs to one output come up all the time: The N inputs are parameters defining a model, and the 1 output is a loss, measuring how well the model fits training data. The gradient can be fed into an optimization routine to fit the model to data. Operator Overloading. One can create a new variable type that has all the common operations of numeric types, which automatically creates an expression graph when the program is run. One can then call the back-prop routine on this expression graph. Hence, one does not need to modify the program, just replace each numeric type with this new type. This is fairly easy to implement, and very easy to use. David Gay‘s RAD toolbox for C++ is a good example, which I use all the time. Source code transformation. Alternatively, one could write a program that examines the source code of the original program, and transforms this into source code computing the derivatives. This is much harder to implement, unless one is using a language like Lisp with very uniform syntax. However, because the backprop source code produced is then optimized like normal code, it offers the potential of zero overhead compared with manually computed derivatives. If it isn’t convenient to use automatic differentiation, one can also use “manual automatic differentation”. That is, to compute the derivatives, just attack each intermediate value your algorithm computes, in reverse order. Some of the most interesting work on autodiff comes from Pearlmutter and Siskind, who have produced a system called Stalingrad for a subset of scheme that allows for crazy things like taking derivatives of code that itself is taking derivates. (So you can, for example, produce Hessians.) I think they wouldn’t mind hearing from potential users. Automatic Differentiation: The most criminally underused tool in the potential machine learning toolbox?